Lapointe, Pierre Louis. "Laval". The Canadian Encyclopedia, 04 March 2015, Historica Canada. https://www.thecanadianencyclopedia.ca/en/article/laval. Accessed 21 April 2019. Île Jésus, first granted to the JESUITS in 1636, recalls the role played by those missionaries in the history of NEW FRANCE. Laval, Qué, City, pop 368 709 (2006c), 343 005 (2001c), inc 1965. Laval was formed by the merger of 14 municipalities: Chomedey, Duvernay, Laval-des-Rapides, Laval-Ouest, Pont-Viau, Sainte-Rose, Auteuil, Fabreville, Îles-Laval, Laval-sur-le-lac, Sainte-Dorothée, Saint-François, Saint-Vincent-de-Paul and Vimont. This island-city, 34 km in length by about 11 km in width, is located in the ST LAWRENCE RIVER, north of Île de Montréal, about 15 km from downtown MONTRÉAL. The second largest city of the province of Québec, Laval is separated from Île de Montréal by the Rivière des Prairies and from the mainland to the north by the Rivière des Mille Îles. 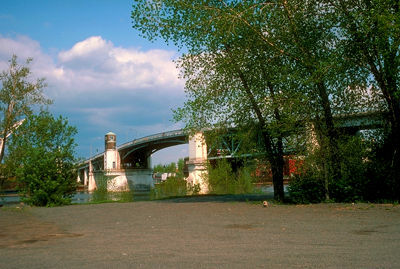 The city owes its name to François de LAVAL, first Roman Catholic bishop of Québec (1674-88) and onetime seigneur (1675-80) of Île Jésus, the island on which stands today's Laval. Île Jésus, first granted to the JESUITS in 1636, recalls the role played by those missionaries in the history of NEW FRANCE. Previously known for its pastoral charms and as a summer resort haven for Montrealers, Laval has become a large suburban city with an important manufacturing and industrial base. Since 1965, the city has grown by leaps and bounds, going from 170 000 to today's 330 000 inhabitants. Laval's traditional economic base, agriculture and limestone quarrying, has given way to metallurgical, pharmaceutical and food products industries. Its diversified economy is based primarily on the service sector but it also has a strong manufacturing sector. Its primary sector, that is agriculture and mining, is now less than 2% of the economy. Part of the city's pharmaceutical sector is INSTITUT ARMAND-FRAPPIER, which specializes in research and development in microbiology and offers laboratory services in this field. In 1995 Laval Technopôle was created. This nonprofit organization administers Laval's industrial parks and promotes the city's economic development to help diversify the economy. Industrial poles or clusters specialized in biotechnologies (Biopôle), horticultural, farm and food products manufacturing (Agropôle), information technologies (Infopôle), aeronautics and space research and production (Aéropôle) as well as a multi-purpose industrial park (Pôle industriel) have attracted thousands of industrial jobs to the area. Laval is not just another sprawling suburban city with a few industrial parks. Amidst reminders of the new modernistic and progressive Laval, the old rural character of Île Jésus is still to be found. A drive around the island leads to the discovery of 26 roadside crosses, scenic riverside parks and old picturesque village centres with their heritage churches dating back to the mid-1850s, such as those of Sainte-Rose and Saint-Vincent-de-Paul. This last-named community is especially well known for its fortresslike federal penitentiary built in 1873. The area around expressways 15 and 440 and Saint-Martin Boulevard has become the nexus of the new city centre. Here is found a concentration of shopping centres and high-rise buildings. Also present are sites of interest such as the Cosmodôme (Space Camp Canada) and Maison des arts de Laval. Musée Armand-Frappier is a science museum dedicated to the career of Armand FRAPPIER. LavalThe official website of the City of Laval, Quebec.